To train the brain of our dogs, I try to give them some doggames every now and then. Ofcourse fysical training is superb for dogs, esspecially the large breeds we have, but it is also very important to get their brains going too. Ofcourse I have a few awsome puzzles for them, and they enjoy them very much, but with some cheap material you can make your own puzzels and riddles yourselve. I put the boxes in some possition and placed the doggiechocolate underneat it. Then today Anna our borzoi girl was the lucky one to try this fun game out. She is used to puzzle so within 1 minute she was finished with it, so I think this is a beginner game, and I will try to do this with the youngsters sometime, maybe they will have a bit more difficulty with it, then Anna. 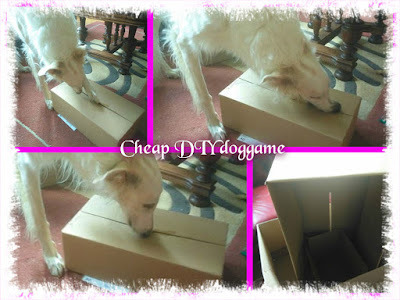 So if you want to train your dogsbrain and don't want to spend a lot of money, this is a great way of making your own, and ofcourse you can make it more challenging if you use more boxes.